Dakshin Bharat Jain Sabha is a powerful social organization of Jains and has completed its 100th anniversary in 1999. It is an organization of Jains in Maharashtra, Karnataka and Goa. The most interesting fact is that many of its presidents were from North India. Sabha is the only organization which has filed a writ petition in Supreme Court of getting minority status for Jains. Veer Seva Dal : Organization of young Jains which has about 160 branches. 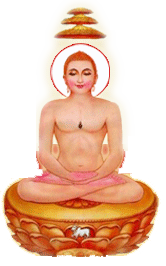 Its main work is to give religious education to young Jains as well as to non Jains. Every year about 6000 students give exams conducted by this organization. This organization gives its service and manpower to any Jain event anywhere in India. It has about 16000 members and they are staunch Jains. This organization has three credit co operative societies with about 32 branches, and three high schools. This organization also works for 'Vyasan Mukti'. In the body of this organization, there are many non-born Jains especially from Dhangar (Shephard) community and Koli communtiy and from 10 different Jain sub-castes. Graduates Association : This organization works for political awareness of Jains. This year it succeded to send 2 Jain MLAs in Assembly of Maharashtra with help of progressive non-jains. Jain Hostels : Dakshin Bharat Jain Sabha Operates 14 Jain Boardings in Maharashtra and Karnataka for both males and females. Until now about a lakh students have taken benefit of the hostels. Scholarships : The sabha gives scholarships to Jain students every year. It distributes about 5 lakh rupees each year amongst Jain students. Publication : 'Pragati and Jinvijay' is 100 year old newsletter of Dakshin Bharat Jain Sabha. It is published in Marathi (from Kolhapur) and Kannada (from Hubli). Sabha also publishes various books on Jains and Jainism in Marathi, Kannada and Hindi. Jain Mahila Sabha : Helps to solve questions of Jain women. Daksin Bharat Jain Sabha want to organize all Jains in south India with help of Keralite, Tamil, Telgu and Tulu jains.